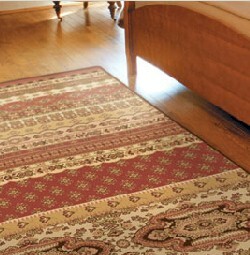 Orian has been producing beautiful, affordable rugs from its Anderson, South Carolina facility since 1979. The state-of-the-art manufacturing plant currently has more than 500,000 square feet dedicated to products and services including yarn extrusion, waving, finishing, packaging, warehousing, and distribution. Orian value begins with materials and continues th,roughout the entire manufacturing process. All looms are connected to a central computer system to ensure consistent quality and optimize efficiency through expert tracking. Original designs, coupled with a wide range of styles and colors, up to 8 per rug, make Orian rugs an excellent choice for any consumer lifestyle and decor need.